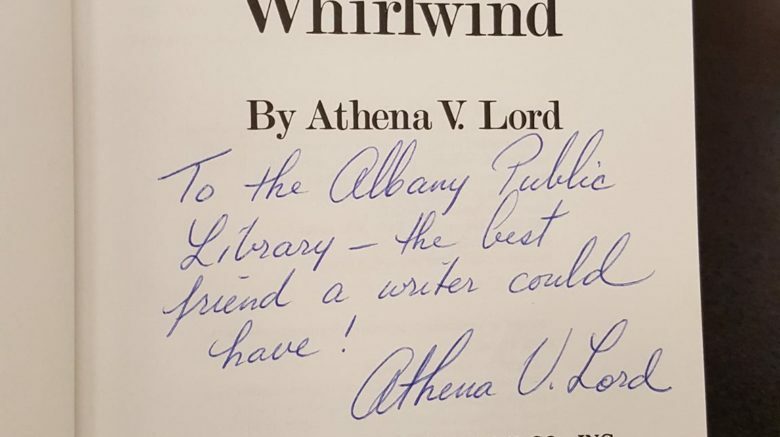 The Albany Public Library Foundation takes great pleasure in announcing Athena V. Lord as our Literary Legends honoree for 2017. The Library Foundation will celebrate Athena’s contributions to children’s literature and to the life of the City of Albany at the 4th annual Literary Legends Gala, to be held on October 21st, 2017 at the Albany Public Library’s John J. Bach Branch. Born in Cohoes, NY in 1932 to a Greek immigrant family, Athena moved to Albany at age 6. Her family lived just around the corner from the old Harmanus Bleecker Library on Dove Street. A voracious reader as a child, young Athena read everything and the Library was a second home. Athena studied creative writing at Vassar College. After graduation, she was selected as Albany’s first “Community Ambassador,” a program of the Junior Chamber of Commerce that sent her to live with a family in Spain for a year. As Community Ambassador, she wrote articles about life overseas for the Times Union, and returned to Albany for a busy year of public speaking and slideshows. She continued her freelance writing career, married, and started a family. Motherhood put her writing on hold for a time, until her children inspired her to write for young people. She is the mother of four children and the author of five books, each book in some way written for her children. Pilot for Spaceship Earth: R. Buckminster Fuller, Architect, Inventor, and Poet (1978) was written for her son. In 1978, Athena made plans to take her son, Chris, to hear the renowned 20th century inventor and thinker give a lecture at RPI. However, a heavy snowstorm prevented their trip to Troy that night. When Athena expressed her disappointment to her son, Chris asked, “why is this man so important anyway?” This unique biography of Fuller was written in response to her son’s question. Her novel, A Spirit to Ride the Whirlwind (1981), tells the story of twelve-year-old Binnie, whose mother runs a company boarding house in Lowell, Massachusetts. This book was written for Athena’s three daughters, as she says, “to give them a glimpse of what they didn’t learn in school.” A young factory girl, Binnie begins working in a textile mill, where she is caught up in the first Lowell women workers’ strike in 1836. The novel won the Jane Addams Children’s Book of the Year award in 1982. Today’s Special: Z.A.P. and Zoe, Athena’s first book about Zachary Anthanasius Poulos and his kid sister Zoe, tells the adventures of two Greek immigrant children in Cohoes in the summer of 1939. Athena wrote Today’s Special to tell a story about the Greek immigrant experience, for her own children and other immigrant children to read. Today’s Special was named Children’s Book of the Year by the Child Study Association and was followed by two sequels, The Luck of Z.A.P. and Zoe (1987), and Z.A.P., Zoe, and the Musketeers (1992).